The first known brewers were Egyptians and alcohol is common to all cultures. Unfortunately, not everyone can handle alcohol. I have a story about tequila and my honeymoon my wife likes to tell. Since alcohol is universal it's not surprising that the science fiction universe is full of drunkards. From lightweights to mean drunks, here are the worst drunks in the known universe. 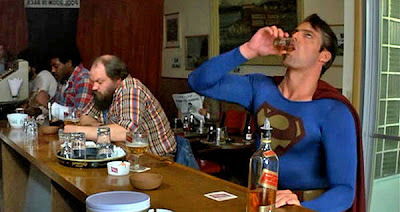 In Superman III (1983), Superman (Christopher Reeve) gets exposed to synthetic black Kryptonite and turns evil. After some general mischief and bad flirting, he ends up in a bar and gets drunk. What makes him a really bad drunk has he started a fight with himself. He split into Clark Kent and Superman and tried to kill Kent in a junkyard...would that have been suicide or murder? When Evil Superman is gone, Clark has to fly around the world cleaning up his mess. Plus, there's that awkward "morning after" conversation with the girl he drunk dialed the day before. Why's He a Bad Drunk? Like many bad drunks, he got into a fight. With himself. In the Transformers (1985) television episode "Microbots" Megatron, and several other Decepticons, get drunk drinking Energon cubes. After complaining about the "good ol' days" of their home planet of Cybertron, he passes out. Why Is He a Bad Drunk? Like many bad drunks, he gets so drunk he allows himself to be violated. 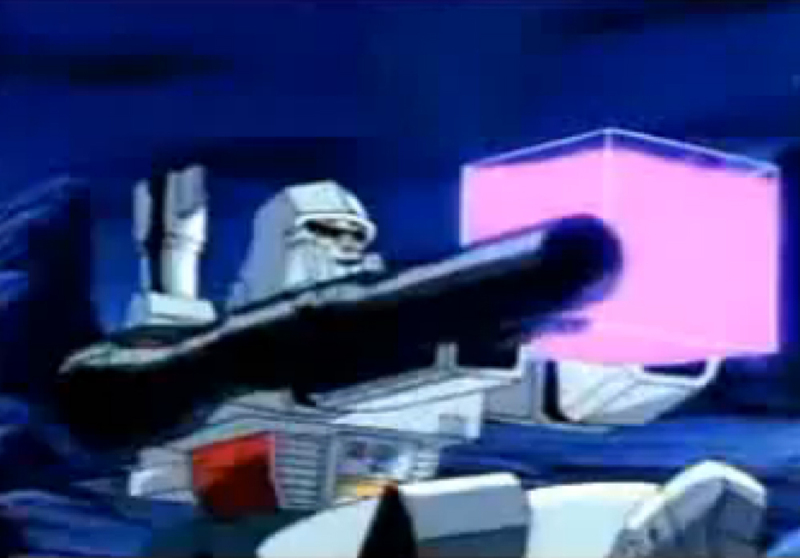 In this case, he lets the miniaturized AutoBots sneak inside him looking for the Heart of Cybertron. If he'd just been able to hold his liquor, he'd be ruling this planet right now. 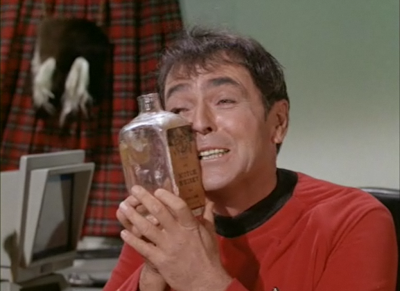 In the Star Trek universe, people don't get drunk. At least Starfleet officers don't. They drink a chemical called "Synthehol" that allows them to get drunk and shake it off. In the movie Star Trek: First Contact (1996) when the crew of the Enterprise is sent back to the past by the Borg, Deanna Troi (Martina Sirtis) goes to a bar and meets the legendary Zephram Cochran. In order to ingratiate herself with him, she gets hammered on tequila. While Cochran went on to invent the Warp Drive, it turns out he was a mean drunk when he was younger. Why's She a Bad Drunk? We can almost excuse her for getting plastered. After all, she may never have tasted hard liquor before. But like many bad drunks, she succumbs to poor grammar and old jokes like "If you're looking for my professional opinion as ship's counselor... he's nuts!" Bad drunks are rarely funny. Tony Stark is an alcoholic in the comic books. In the movie, ­Iron Man II (2010) Stark (Robert Downey Jr.) is so upset about his early death by metal poisoning that he drinks himself stupid at a party. He trashes his house, shoots watermelons and blows a hole in his roof. Then, when his friend tries to take the keys to his suit, he gets in a fight. 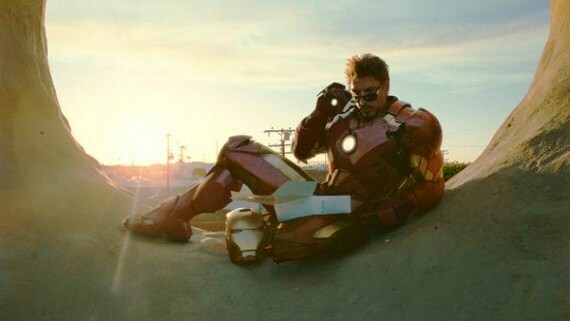 Tony wakes up the next day sitting in a donut and late for an important meeting with Nick Fury. Not bad for a genius, billionaire philanthropist, but not exactly Steve Jobs. Like the worst drunks, he decides to operate heavy machinery after drinking. In Star Trek (2009) James Kirk (Chris Pine) goes to a bar and tries to hit on a girl. He's drunk out of his mind but still manages to holla at Uhura (Zoe Saldana). Then, her friends arrive and he gets into a fight. If Captain Pike hadn't shown up, he would have been spitting teeth. After Kirk sobered up, Pike offers him a job thanks to his famous father. Ah, nepotism. The salvation of drunken frat boys everywhere. Like the worst drunks, he starts mouthing off and gets into a bar fight. 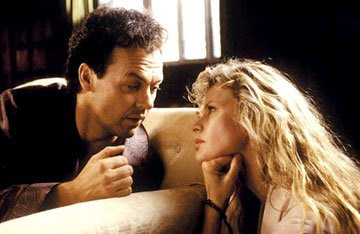 In the movie Batman (1989) Bruce Wayne (Michael Keaton) and Vicki Vale (Kim Basinger) spend a quiet evening at his home drinking wine and listening to his butler, Alfred, tell childhood stories. Drunk from the wine, Vicki stumbles upstairs to Bruce Wayne's bedroom, barely able to stand, like a drunk girl at a frat house. In the morning also, her new "boyfriend," Bruce, has left her alone and doesn't return her phone calls for days. Who says romance is dead? Like the worst drunks, Vicki wakes up in a strange bed with only a vague recollection of how she got there. In Star Wars (1977), Obi-Wan Kenobi (Alec Guinness) and Luke Skywalker (Mark Hamill) go to a bar in a bad part of Mos Eisley. There, two drunk aliens start insulting Luke. In the expanded universe they were given the names Ponda Baba and Dr. Evanzan. Too late, the aliens realize they're messing with a Jedi. This works out pretty badly for the pair. What seemed like a fun gag at some poor farm boy's expense leaves one guy without an arm and the other badly wounded or dead. It turns out that "little one" wasn't worth the trouble after all. Why Are They Bad Drunks? They started a fight with someone before checking to make sure they weren't a Jedi. 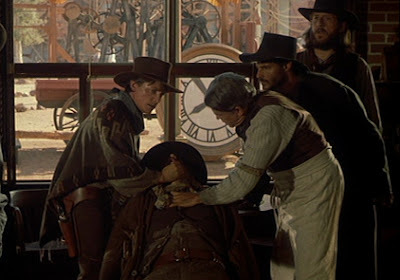 Doc Brown (Christopher Lloyd) travels back to the Old West in Back to the Future: Part III (1993). He's heartbroken about losing his girlfriend Clara. So, he heads for the bar. He nurses a glass of whiskey all night. When he actually does drink it, he immediately passes out. Turns out the Doc can't hold his liquor. It takes the bartender's special cocktail called "Wake-up Juice" to get him to wake up. He ends up screaming, running outside and dunking his head in a horse trough. Have you ever tasted horse house water? Neither have I. But if it tastes anything like a horse smells, he'll need about a gallon of mouthwash. He wakes up with a terrible headache. It only takes one drink to knock him out. The Doctor in Star Trek: Voyager is a hologram and doesn't eat or drink, but in the episode "Body and Soul" he hides from an alien inside Seven of Nine's (Jeri Ryan) brain. While in control of Seven of Nine's body, the alien pressures them to drink and The Doctor gets Seven plastered. The Doctor gets the alien captain to let them go and they are saved, but Seven accuses him of "abusing her body." Turns out, like the worst drunks, he doesn't know when to quit. At a party, Seven of Nine gets hammered. She complains her visual cortex is malfunctioning and the Doctor discovers that her blood synthehol level is at .05. The horror. Turns out she got drunk from one glass of champagne. One glass. Of synthehol no less. The drink that people aren't supposed to get drunk on. Like many drunken party guests she stumbles out leaning heavily on the Doctor saying he has always been "of enormous help" to her. She yells, "We are as one! We are as one!" This is the Borg equivalent of "I love you man!" The others laugh about "their" drone. It only takes one drink of synthetic alcohol to take her down. In Star Trek: The Original Series' Scotty (James Doohan) was known for his drinking problem. In fact, like many stereotypical Scotsmen, he loved to drink. At the same time, he was the ship's engineer. So, you have an alcoholic engineer operating a starship. While he was never caught on the job, how many times did he screw up? We'll never know. He always said it was the alien's fault. Like the worst drunks he was a functioning alcoholic. There you have the most hilariously bad drunks in the universe. 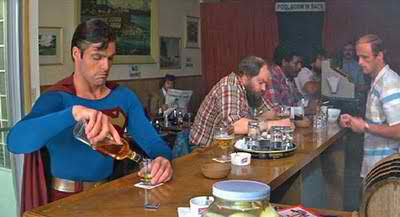 So the next time you’re at a bar, if you see Superman nursing a beer or Seven of Nine looking tipsy, head for the door. These guys cannot handle the sauce. Who Do You Think Is the Worst Drunk in the Universe? Should 'Star Trek Voyager' Characters Be In New 'Star Trek' Movies? Not the worst, but Seven of Nine and Troi drunk were both very amusing! I bet Morn from DS9 could take all these guys in a drinking contest. happy days... 7of9, good for you... she can assimilate me any time. I love that "We are as one!" moment. Classic stuff. I loved Scotty. Don't forget the fight with the Klingons when they called the Enterprise a garbage scow. There was that dude there selling the tribbles who drank a lot, too. Did the Cardassians drink? Bet the Klingons aren't fun drunks to be around. Good one Gene. I'll add to the honorable mention list. Endangering a minor. For shame. Another one for the Honorable mention list Pat! A classic line Tony, like Alex said, Jeri Ryan is very funny. Liesel, you make a good point. I guess Bajorans don't get plastered very often. Glad you enjoyed the list! Scotty knew how to throw down MPax. Maybe we should have a list of Scotty's best fights?